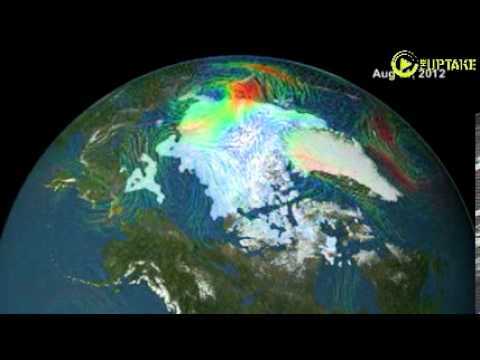 This animation shows the seasonal change in the extent of the Arctic sea ice between March 1, 2012 and February 28, 2013. The annual cycle starts with the maximum extent reached on March 15, 2012. Every summer the Arctic ice cap melts down to its minimum extent before colder weather builds the ice cover back up. This new ice generated on an annual basis is called 'first-year' ice and is thinner than the older sea ice. The perennial ice is the portion of the ice cap that spans multiple years and represents its thickest component. On September 13, 2012, the sea ice minimum covered 3.439 million square kilometers, that is down by more than 3.571 million square kilometers from the high of 7.011 million square kilometers measured in 1980. The annual maximum extent for 2013 reached on February 28 reached an extent of 15.09 million square kilometers.